The python was found sleeping on top of a fence. Workers at a factory in Thailand were shocked when they arrived at work - only to find a huge python sleeping there. According to CGTN, the incident took place on Thursday at Chonburi, Thailand. Workers were in for an unpleasant surprise when they arrived for their morning shift and saw the python taking a nap on the factory fence. 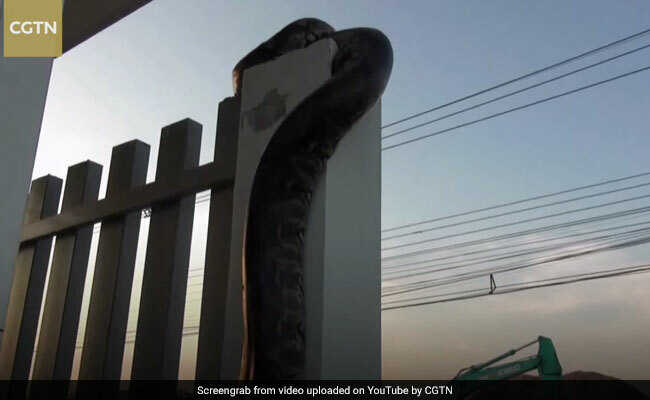 It is assumed that the large snake slithered onto the gate and curled around the top of the concrete corner post, where it was found. CGTN reports that the python - which is estimated to have weighed between 30 to 40 kgs - was roused from its sleep by a snake catcher. Luckily, nobody was injured in the incident, and the python was captured and released back into the wild. In October, a python fell from the ceiling during a staff meeting in China, scaring everyone present.